Several recipes call for using readymade biscuit dough, but I like the idea of making this from scratch. Combine milk, ½ cup butter, sugar and salt in a saucepan; beat until butter melts. Cool to 105 to 115 degrees; add yeast, stirring until dissolved. Place flour in a large bowl; add milk mixture, and stir until well blended. Cover and let rise in a warm place (85 degrees), free from drafts, about one hour and 20 minutes until doubled in bulk. Roll into 11/2 inch balls; dip each in melted butter. 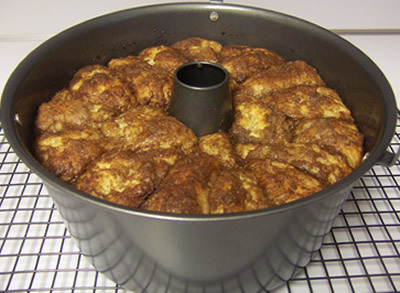 Layer balls of dough in a 10-inch one piece tube pan or Bundt pan. Cover and let rise about 45 minutes or until doubled in bulk. Bake at 375 for 35 minutes. Cool in pan 5 minutes; invert onto serving plate. So basic and simple and soooo very good! Truly comfort food.